For the Hillsborough High School boys volleyball team, 2013 is all about maintaining the status quo. The Raiders have won four of the last five Skyland Conference regular season titles and they’ve been among the best teams in the state over that period, but according to head coach Todd Sudol, Hillsborough isn’t getting the credit they deserve state-wide. One reason for optimism is the fact that Sudol has eight seniors on his roster, including setter Joey DeLuca, who was second in the state last season with 809 assists. Tim Erdman, one of the team’s outside hitters, had 356 digs last year and Alex Duncan leads a strong front line defense. Duncan registered a team-best 40 blocks in 2012. Some of those goals include staying at the top of the Skyland Conference, finishing in the top 10 in the state polls and maintaining status as an elite program. “Hillsborough boys volleyball is a young program,” Sudol said. “This is only our ninth season of competition, but the kids have established themselves as one of the best in the state. We always want to equal or do better than we did last year. The team-first attitude that Sudol praises will be put to the test in the season’s opening week. The Raiders will play on four of the first five days of the season, including the invitational they’re set to host on April 6. Their first three matches are against Watchung Hills, Cinnaminson and Ridge. The Hunterdon Central High School boys volleyball team, runner-up in the Skyland Conference Tournament in 2012, will have to replace eight seniors from a squad that went 17-6 and reached the quarterfinals of the NJSIAA Central sectional tournament. Hunterdon Central will have to fill the holes left by outgoing seniors like Christian Hawkinson (316 assists, 31 digs), Johnny Bowser (168 digs, 15 service aces), Pete Desvouges (110 kills, 67 digs) and CJ Norsigian (101 kills). But Fenton is looking at Kevin Tripp as someone who can help bridge the gap from last year’s senior-laden team to this season’s younger squad. The Red Devils open their regular season April 2 against Skyland Conference rival Bridgewater-Raritan. Bridgewater-Raritan reached the quarterfinals of the NJSIAA North 2 Tournament last spring as the No. 3 seed with the help of two players that like to get low and dig the ball off the floor. Co-captains Jack Fieseler and Drew Ungerleider combined to dig 244 balls last season, with Ungerleider recording 135 of those. Fieseler also registered 121 kills for Bridgewater-Raritan. Head coach Corey Romanak expects Fieseler and Ungerleider to guide a young team that has three sophomores and two juniors in the rotation. But in those scrimmages, Bridgewater-Raritan has taken on the likes of Fair Lawn and St. Joseph (Metuchen), some of the state’s best teams. The goal is to get the team ready for big games when they actually count. If the Panthers are to be successful in 2013, it’ll be because they develop team chemistry, according to Romanak. Ahjon Petty was one of the stars for Piscataway last season, finishing with 235 kills, which was good enough for the 17th most in the state. Himang Patel, who collected a team-best 361 assists last year will be back for his senior season along with Myles Miller, who registered a team-best 70 blocks last spring. Piscataway opens its season against perennial state power East Brunswick on April 2. Hillsborough will host a season-opening invitational tournament for the eighth straight season on April 6. The event, which will get underway at 9 a.m., will showcase some of the best teams in the state in a three-court format, including St. Joseph, Hunterdon Central, East Brunswick and Piscataway. Two-sport star Danny Leung is expected to lead the East Brunswick High School volleyball team again this season with his well-rounded game. In 2012, Leung led the team with 143 kills, 59 digs, 21 service points and 14 service aces and this winter he helped East Brunswick go deep into the state basketball tournament. According to head coach Greg Rutz, Leung’s success on the basketball floor is only going to carry over into success on the volleyball court. Classmates Jack Fredicks (110 kills, 14 service points, 13 service aces) and Alec Weissman (276 assists) also return to bolster a deep and talented roster a year after they went 16-6 and reach the quarterfinals of the NJSIAA Central sectional. “We bring back five starters and I think we’re 40-50 percent better than we were last season,” Rutz said. “I took over in 2001 after East Brunswick had won state titles in 1999 and 2000. I was scared as a first-year coach and we won a state title anyway in 2001. Home News Tribune Player of the Year Aiden Albrecht’s 46 service aces were the fifth most in the state and he teamed with Steven Bonilla and Junior Oboh to lead Old Bridge to the semifinals of the NJSIAA Central sectional a year ago. The Knights beat St. Joseph in the GMCT final for their second conference tournament in the last three seasons. Bonilla collected 551 assists and Oboh led the team with 205 kills last season. Old Bridge went 20-8 in 2012 before losing to Christian Brothers Academy in the postseason. Head coach Andrew Hopman said that a repeat of last season’s success is attainable and very much the goal for the Knights in 2013. Albrecht is unquestionably the leader of Old Bridge’s attack and Hopman dished out high praise for the senior. The Knights open their season April 2 against J.P. Stevens. 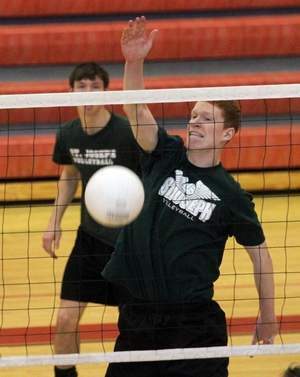 Bryan Kolpuc led Woodbridge to an 11-9 record in 2012 by ranking fourth in the state with 389 digs. Kolpuc also registered 37 service aces, which ranked 13th statewide. But the Barrons have a lot to replace from last season’s squad. Brandon Flores recorded a team-best 273 assists last season and Nick Stefanicha was one of Woodbridge’s best defensive players, registering 319 digs and 46 blocks. Craig Conklin and Bryan Cromwell, who combined for 527 digs in 2012. All four have graduated. The Barrons get their season started April 1 against Essex County Vocational School. Last season, the St. Joseph High School boys volleyball team was among the state’s best for a good majority of the spring. The Falcons ran up a 32-6 record, were the top-seeded team in the Greater Middlesex Conference Tournament and secured the top seed in the NJSIAA Central sectionals. But for all of the success they had in the regular season, St. Joseph ended its campaign without a title. Old Bridge knocked the Falcons off in the GMCT final and eventual champion Cinnaminson disposed of the Falcons in the semifinals of the state tournament. But, with the new season set to start next week, St. Joseph has its sights set on reclaiming the hardware. The Falcons have been in the GMCT final every season since there has been a tournament, but Old Bridge has won two of the last three crowns. St. Joseph is loaded for another deep run, led by senior Kurt MacDonald. MacDonald collected the seventh-most digs in the state last season with 367 but, according to Cabrita, he’s not the only player to pay attention to this year. Finan led the team with 257 kills last season and Dacey collected a team-best 150 assists. The Falcons need to establish chemistry in order to be successful, at least in the eyes of Cabrita, who said last season the team’s chemistry went away at the wrong time. Some of the depth players for St. Joseph should help the Falcons meet their goals this season, with Thomas Durrell, Greg Jajtay and Ray Kowalski all expected to play pivotal roles. St. Joseph will head to Rhode Island for the fourth straight season to compete in an out-of-state tournament that they’ve won every time. Once they return home and conference play starts, Cabrita knows GMC foes will be waiting for them. St. Joseph gets its season underway on April 2 when they host a quad-meet against Bergen Catholic, Bloomfield and Elizabeth. They’ll also battle West Windsor Plainsboro-South in the afternoon to cap a busy opening day. EDISON — Professional athletes aren’t always obli­gated to give their time speaking to high school stu­dents, but for Donald Jones, it’s something he enjoys. 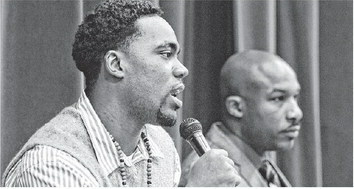 Jones, a former Plainfield High School star football player, and Greg Harris, a retired professional bas­ketball player, spoke to students at Edison HighSchool Tuesday morning, trying to ensure that the students realized that it takes hard work both on and off the field to reach the level of stardom they aspire to reach. Jones, who graduated from Plainfield in 2006, re­cently signed a three-year free agent contract with the New England Patriots, after spending the first three years of his career with the Buffalo Bills. But being back in New Jersey, where he still makes his off-season home, and speaking with high school students was something that Jones was eager to do when approached by Edison track and field coach Veronica Harris. “These kids didn’t really know I was from the area until today, a lot of them were shocked to find out,” Jones said. After graduating from Plainfield, Jones went to Lackawanna Junior College and then to Youngstown State prior to joining the Bills as an undrafted free agent in 2 010 . Jones is well aware that he’s joining a team capable of competing for a championship this season and what would make it even sweeter would be to play in Super Bowl XLVIII at MetLife Stadium next February in front of his home fans and family members. Harris, Veronica’s brother, played basketball at DeMatha High School in Maryland and then went on to Mount St. Mary’s University, where he helped the Mountaineers to the NCAA Tournament in 1999. After graduating in 2000, Greg Harris spent eight seasons in Europe, playing mostly in Belgium and Holland, before retiring in 2008. He currently teaches at Friendship Collegiate Academy just outside of Washington and said he tried to express how important school is to the student athletes from Edison. “I was trying to say that if you apply yourself academically, you should be able to excel athletically,” Greg Harris said. TRENTON — The Sun National Bank Center in Trenton, more widely known for hosting graduations for local high schools, was on center stage Tuesday evening as the NJSIAA Tournament of Champions Final was held in an arena outside of the Meadowlands for the first time in recent memory. The 8,600-seat arena in Mercer County was about half-full during the Boys final between second-seeded St. Joseph and top-seeded Roselle Catholic. The Lions won their first ever Tournament of Champions title 65-49. Both schools had large contingents of students in the stands, standing in unison throughout the contest and at times battling each other through chants and taunts. But in the end, the game was won on the court, not in the stands, at least in the eyes of one of the pivotal players in the contest. Instead of having the game at the vacant Izod Center in East Rutherford, an arena with 20,000 seats that would have drowned out the crowd noise, the NJSIAA moved its signature contest to Trenton for the first time in the 25-year history of the event. One of the louder moments of the contest came with 2:12 remaining in the third quarter, when Towns went over 1,000 career points with a made layup. The crowd gave Towns a standing ovation. Fans and students from both schools had a longer than usual commute to the game, some traveling in excess of one hour to make it to Trenton for the opening tipoff, but the St. Joseph mascot was in the stands early pumping up his classmates. One of Vitale’s classmates, senior Christian Goldy, said that driving a little bit further than usual wouldn’t keep the Falcons fans away. Two years ago, Union Catholic High School’s Zach Ghizzone was a baseball player who joined indoor track to stay in shape for baseball season. But, with the will to win and the desire to be great, Ghizzone emerged as one of the stars for Union Catholic’s track team, and this winter made a name for himself as one of New Jersey’s best athletes. Ghizzone took home the gold medal in the 55-meter hurdles at the Meet of Champions with a time of 7.51 and helped Union Catholic win the Union County and Non-Public B team titles. He is the Courier News Boys Indoor Track Athlete of the Year. Along with the 55-meter hurdles, Ghizzone runs on the Vikings’ 4×400 relay team, but he was injured and didn’t compete at the Meet of Champions. He said that he had to persuade his coaches to let him run in the 55-meter hurdles and it’s a good thing they obliged. The extra work that he put in included running on the cross country team for the first time, something Ghizzone did only because they needed some extra runners. Ghzzone said that he learned a lot from running cross country that he took into the winter track season, including how to pace himself better and finish 400-meter races with better speed and energy. At the Non-Public B State Tournament, Ghizzone was part of the winning 4×400 team that clocked 3:28.30, 12 seconds faster than second-place Roselle Catholic. But Ghizzone’s crowning moment of the season came when he won the Meet of Champions title in the 55-meter hurdles. One member of Ghizzone’s family that was there was his teammate and brother Andrew, a junior on the Vikings squad who excels in the 1600. Having Andrew on the team helps push Zach to new heights, especially when they’re competing in different events. 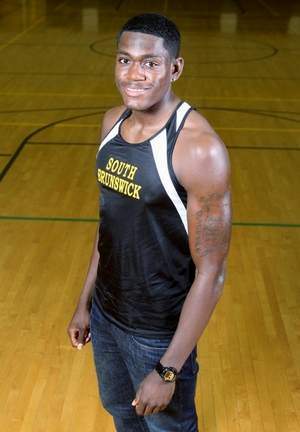 For South Brunswick High School’s Jonathan Pitt, this winter track and field season was all about tapping into the limitless potential he possesses in his 6-foot 5-inch frame. Pitt served as the anchor of the shuttle hurdles, 4×200 and 4×400 meter relay teams for the Vikings and helped lead South Brunswick to the Group IV Relays championship. On the side, he broke the state record in the triple jump. 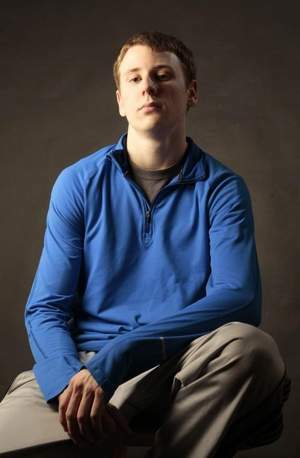 He is the Home News Tribune’s Boys Indoor Track Athlete of the Year. Pitt took on the challenge of anchoring the Vikings’ relay teams this winter, something that his coach Adam Nalven said was a good thing for him. At the state relays, South Brunswick won the shuttle hurdles with a time of 31.07 and finished second in the 4×400 with a time of 3:27.65. The Vikings placed eighth in the 4×200 in 1:34.94. Pitt ran the fourth and final leg of each race and relished the opportunity to be the one counted on to finish out the races. But an event that’s not contested in the wintertime is where Pitt makes his mark. He set the New Jersey state record in the triple jump with a distance of 49-7.5 at an invitational in February. Pitt has his sights set on an even bigger number once he gets outside in the spring. And with the triple jump being scored in events this spring, Pitt said he thinks South Brunswick has a chance to be great, and he envisions himself leading the way. Nalven said that Pitt’s goal, which the two have talked about at great length, is to set the New Jersey record for the triple jump outside now that he’s done it inside. The Old Bridge High School track and field program, long one of the most successful in the Middlesex County, suffered through a bit of down season a year ago. But in 2013, the Knights recaptured their throne at the top of the Greater Middlesex Conference, winning the boys and girls titles at the GMC Championships thanks in large part to a pair of men who have been coaching for more seasons than their athletes have been alive. Old Bridge’s Jack Campbell and Steve Gajewski, who guide the boys and girls teams respectively, are The Home News Tribune’s Indoor Track Co-Coaches of the Year. The success of Old Bridge’s winning teams can be linked closely to 30-year veteran Campbell, one of New Jersey’s most respected mentors and someone Gajewski had learned a lot from. “He has been doing this for a long time and he knows his stuff and it’s awesome to work with Jack on a daily basis,” Gajewski said. Like many great athletes, Immaculata High School junior bowler Chris DiPaola puts in a great deal of work on his craft to improve from season to season. But DiPaola made a meteoric rise between his sophomore and junior years, bringing up his average from 206 to a Skyland Conference-best 219 this winter. 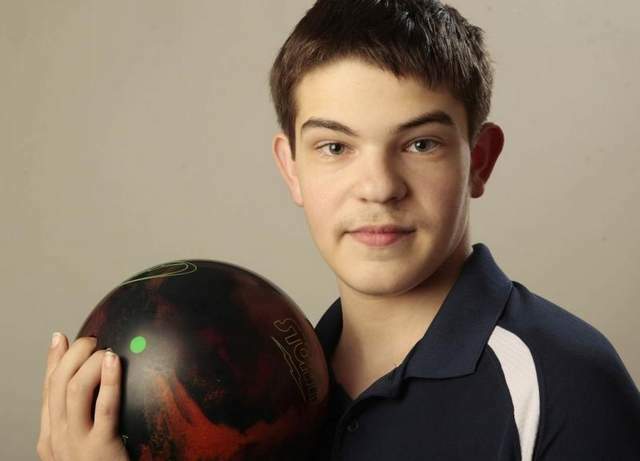 DiPaola is the Courier News Boys Bowler of the Year. When asked what the biggest difference was for him this season, DiPaola wasn’t quite sure how to reply. Along with the 219 scoring average, DiPaola posted five 700 series and 11 600’s. According to head coach Frank Mazzariello, DiPaola rolled a score of 200 or higher in 37 of his 51 games this winter. One of the more impressive moments from DiPaola’s season was the 300 game he bowled in mid-January. The perfect game was one of just two bowled in all of the Skyland Conference this season, with teammate Zack Vitelli firing the other on Dec. 19. DiPaola credits his friendship and friendly competition with Vitelli for pushing him to get his own perfect game. The Immaculata boys squad didn’t have enough able bodies to compete in statewide tournaments, which hindered DiPaola and his teammates from bowling as many games as some of their friends in other conferences. But, even though they were put in a difficult position, DiPaola helped keep his team upbeat and positive, according to Mazzariello. Throughout the season, DiPaola steadily improved his game, climaxing at the Skyland Conference Tournament in late January. DiPaola rolled the highest game of any Skyland bowler with a 266, something he said will help him stay motivated for next season.